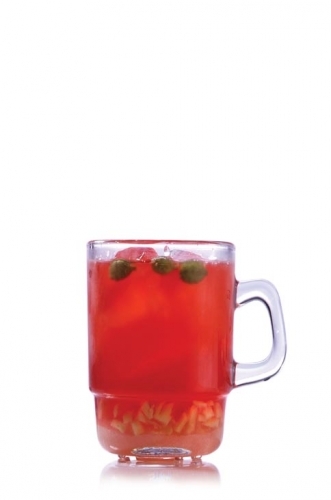 • Brew 4 teaspoons (8g) of Dilmah t-Series Natural Rosehip and Hibiscus in 300ml of boiled water for 3 minutes. • Strain the liquid to remove the leaves of the herbs. • Add 100ml of sugar syrup. • Add 2 tablespoons of finely grated ginger. • Squeeze the juice of a lime on to the beverage and add 300ml of cold water. • Stir for 2 minutes until the sugar is dissolved. • Let the beverage cool and pour into the screw top jug and let it stand for 2 days. • After 2 days have elapsed strain into bottles with tight fitting lids. • Add the cardamom pods into the bottles. • Shake the bottle and leave out in room temperature for 1 day and then refrigerate.